There are several things to note in this example. First, some investigation occurs at each step. Don’t assume or take things for granted. Go see and verify. Second, this example has five iterations, but the actual number could be more or less. The point is find and fix the real root cause of the problem. Third, the discovered root cause revealed a broken process or alterable behavior. Remember, people don’t fail but processes do. Focus on fixing processes for long-term sustainable improvement. Lastly, not all problems have a single root cause. To uncover multiple root causes, you will need to repeat the method asking a different sequence of questions each time. Fishbone diagrams are useful in visualizing and categorizing multiple root causes. 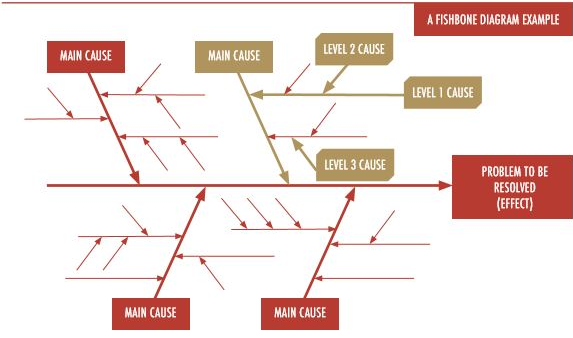 Also called a cause and effect diagram or a Ishikawa diagram (for its creator, Japanese quality control expert Dr. Kaoru Ishikawa,) fishbone diagrams help teams to brainstorm and focus conversation while avoiding solutions that merely address symptoms of a larger problem. The diagram, which resembles the skeleton of a fish, is typically worked right to left with the “head” representing the problem and at least four main potential causes (i.e., the “bones”) branching out from the backbone. From these bones, you can document in more detail things that contributed to the cause. See a depiction below. Grouping the causes allows you to think about the different elements of the problem as separate from the overall process. These can then be prioritized to determine which are having the largest effect.